Today was in the 80's, breezy, and mostly sunny. Really. I think this coin quilt sums south Florida up pretty well. Cheery, warm, sunny, bright, and a bit tropical. 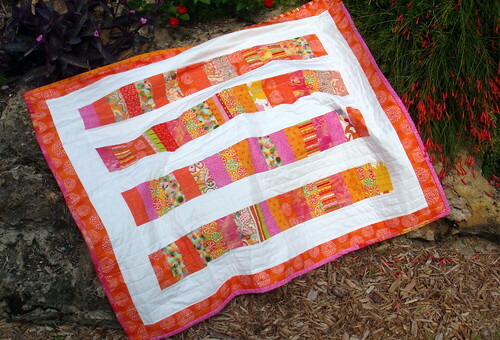 This started out as an orange and blue quilt. Well, it was going to be orange and blue until I mentioned that idea to my daughter. She made a face ... and not one that said "What a great idea Mommy". As soon as I saw the face I started thinking Florida Gators and, while they are ok and quite popular around here, I wasn't really excited about making a quilt of their colors. So I went with orange and bright summer colors. 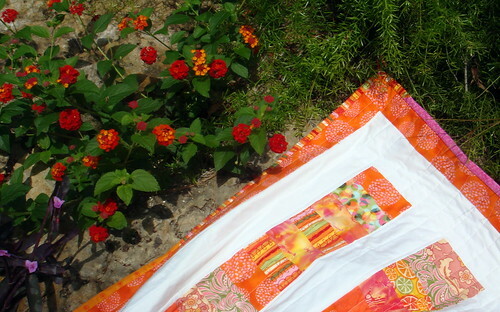 I still want to make an orange and blue quilt but I'm going to put that on hold until I have some orange/blue fabrics that aren't Gator colors. 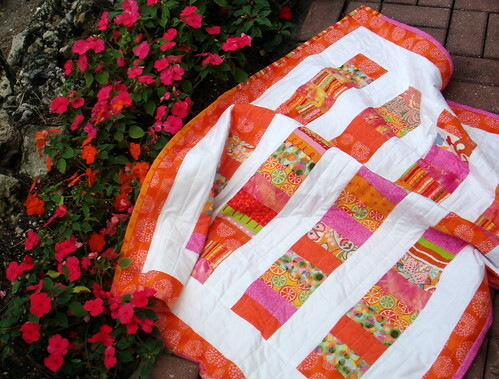 I quilted with long not-very-straight lines running the length of the quilt. 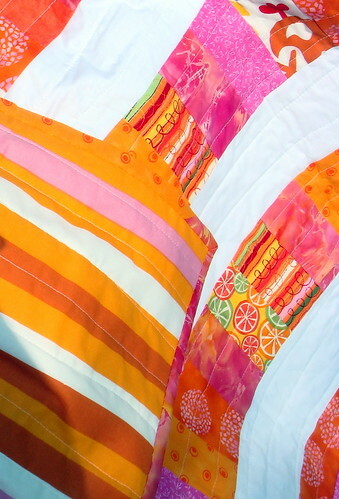 The backside fabric is is orange and white striped, from Ikea. 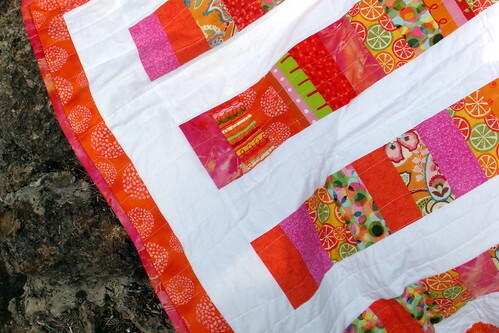 The binding is pieced from a number of fabrics that are in the quilt. These pictures were taken at the pool at my parents condo. I should have taken a picture of the entire area (I will next time I'm there). The flowers are incredible and are everywhere. In fact, the landscaping as a whole is wonderful. It's a beautiful pool and pool area. I do like it a lot. gorgeous...and your photos make me long for spring sun and flowers and warmth....lovely pictures!